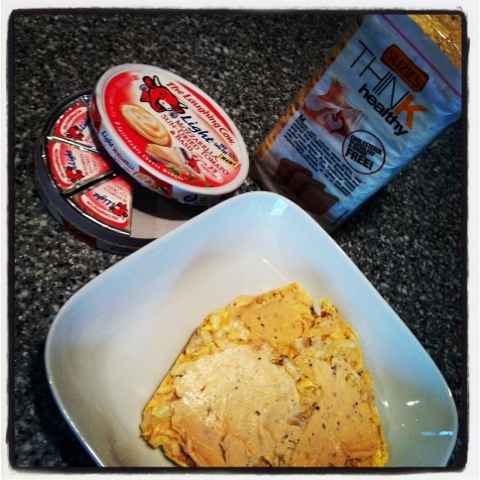 Fit Mama to 3: Snack Time! I am NOT a huge snacker because lets face it I don't really have time to snack. I usually grab a piece of fruit, carrot sticks, banana peppers, a pickle or sometimes 100 calorie packs. Once I stumbled upon this find I KNEW it would be a staple in our house. Suzie's Think healthy little whole grain snack cakes are AMAZING! They taste similar to a rice cake, but thinner, crispier and more satisfying. They come on different flavors, but I like the plain. You get three cakes for 38 calories! For the kids or even myself sometimes I top them with peanut butter. But my favorite is flavored laughing cow cheese for 35 calories. Today I used the Mozzerella Sun-Dried Tomato & Basil. I also love the blue cheese flavor. The things you could top these little beauties with is endless. I scored the thins at Whole Food for $2.99 and the Laughing Cow you can find pretty much anywhere, but mine came from Lucky's.